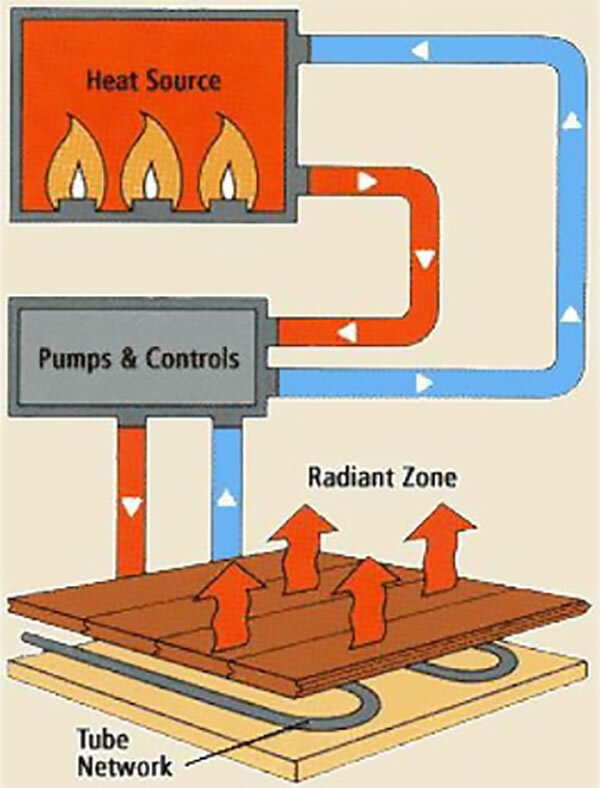 Radiant heat systems use a three-stage process to convey heated water to its destination. (See diagram). Work with the system designer to choose the subfloor option (see illustrations.) The heat system designer is responsible for the subfloor installation, but you will want to be familiar with the choices. Direct contact of the tubing with the flooring is not recommended. The subfloors shown here are recommended for hardwood floor installations. Plywood (5/8") or oriented strand board (3/4") make good candidates for subfloor materials in radiant installations. Particleboard subfloors are not recommended by radiant heat companies. Mechanical Humidity Control: The heating-ventilation-air conditioning (HVAC) system should have mechanical humidity control. This will monitor the room and keep the relative humidity at an even level, which will keep the equilibrium moisture content of the floor stable. Technical assistance and/or photos provided by; HeatLink USA Inc., Grand Rapids, Mich.; Heatway, Springfield, Mo. ; Wirsbo, Apple Valley, Minn.